Wonersh Pre-School was established over 40 years ago. Located in the centre of the village, it is a community led pre-school run by a committee of parents and staffed by trained and experienced play leaders and assistants. There is a very low turnover of staff, which benefits the children enormously. 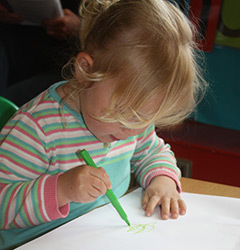 The pre-school is registered with OfSTED and is a member of the Pre-School Learning Alliance. "I have noticed a tremendous change in my daughter since joining Wonersh Pre-School. She has become increasingly confident, trying new activities without hesitation, developing very good relationships with children and teachers alike. The biggest development has been in her communication and therefore her social skills. This has been down to the support and work of the staff at Wonersh Pre-School." We have exclusive use of two rooms on the church premises which benefits us and the children as we can make it "our own", creating a homely environment, helping our children to settle and feel comfortable and confident with us. It also means that younger and older children have their own rooms, which is beneficial in the settling-in process and deciding on age appropriate activities. Fantastic dedicated outdoor areas comprise a large fenced grass garden overlooked by Chinthurst Hill with climbing frames, playhouses, pirate ships, slides, sand, water and vegetable and flower beds. We also have a safe fenced off playground where the children can develop their gross motor skills enjoying cars, bikes, scooters and sand, as well as chalk drawing on the tarmac or drawing on a large outdoor blackboard and imaginative play with outdoor games. "Brilliant staff, amazing facilities, lovely outdoor space. Both children have loved the baking and arts and crafts that are available. The Tuesday afternoon session before starting school is also very useful."